A Taylor Hicks picture, that is. I’m still away, but I wanted to drop off a quick little gift for Thanksgiving — a recent picture of Taylor in the studio. Oh my . . . what a wonderful Thanksgiving present! Look at Taylor, looking all happy, in the studio! I didn’t think anything could make me more antsy and impatient for that new music, but I am going to be on the edge of my seat from this moment until the CD is released. Oh my! How generous of you to take time from your vacation to bring us this wonderful picture of Taylor in the studio! It’s music to the heart and ears! This visual makes the anticipation harder to take! omg! I clicked on RHS just by habit and thought, “Oh, yeah, nothing’s happening here today”, but then…!!! OK. How do you get these? We want to know. LOL. Who did you have to bribe? LOL. He looks great and Bill is there and the guy behind Bill sure looks familiar? Hey, soulaz and Harp (I’m acting like we three are the only ones here. ha!) Hey, everybody, did you read that thing in TV Guide about how Taylor plans to do an “intimate club tour” while he does the Grease tour? Could you die? *sobbing* I want to be in one of those intimate clubs!!!! Thanks TH!That’s a great Thanksgiving treat!Great to see him in the studio.I can’t wait for the new album!!! caryl- we are the only ones here.. this is our intimate setting! Yes, I read that article. I can’t wait till Feb! Rams Head front row! I refuse to squee about it though.. I have never squee’d in my life. Okay, there was this one time.. but.. eh… long story.. WHAT??!! You’re going? Are you TRYING to make me cry? No wait, what I MEANT to say, Harp, is that I’m very happy for you! Nice shot of Taylor’s knee. Why do I want to tickle it? Who is the guy in the back with the long hair and his arm on Bill? He looks so familiar to me. BTW do you think the man in black sitting next to Tayor is Climie ?? Thank you so much for the picture TaysH…..and Happy Thanksgiving to all. Exciting to see an in studio shot. Can’t wait to hear the results. He is looking good. He is somewhere warm because he is wearing shorts. LA, I guess, and that is not Lower Alabama! Wow! I guess “it takes a village to make a Taylor album!” Thanks for the nice Tahnksgiving gift. Guess Taylor is a believer in the old saying ~~ “The more the merrier”! It does help if the ones you’re working with make you happy, doesn’t it! Thanks much TaysHarmonica…this is great (lol, it’s been a long time….I only recognize Bill Will?) happy turkey day! Thanks TH! Awesome picture! I can barely stand the wait for the new music! Sweet!….Thanks TH….Happy Thanksgiving to all. Thanks, TsH, great picture. Have a great Thanksgiving. Taylor knee…. thank you for Taylor knee…. I’m happy. I was hoping there would be one familiar face there (not including BW), like Loren or Brian or someone- but everybody looks like they’re enjoying themselves. And we’ve got the straight-across bangs again….just can’t get away from them. Thank you, TH- he looks mah-vellous!! WoW! This is great. I don’t know why but all those guys look like great musicians to me! Thanks for the Thanksgiving Eve present, TH !! And Taylor, wherever you are. Bloggerina, you never cease to amaze me. What a GREAT surprise to find this cute picture of Taylor (and friends) in the studio. He is a doll. He looks so happy. I KNOW that CD is going to be a killer! Happy Thanksgiving, EVERYONE!!! Enjoy yourselves! Whoever is taking their picture, they like. Fun picture. OMG-fun fun fun!!!! Thanks for this-something else to be thankful for!!!!!!!!! Thanks for the pic. It was just what I needed to make Thanksgiving perfect. Love seeing Taylor in the studio. For that, we are all thankful. What a great special photo for us! And a wonderful Thanksgiving surprise–much better than eating all that food! I do recognize one or two of the guys–dont ask me their names…the guy with the dark hair and standing behind Tay…and the guy in front of him. Things that make you go hmmmmm…. I didnt even recognize Bill! Taylor looks so happy and CANNOT WAIT FOR THE ALBUM!!!!!! Happy Thanksgiving to everyone! And a very special thank you to you, Bloggerina! thank you that what we need to see taylor in the studio and happy he deserve it way to go taylor cant wait to hear the new music happy thanksgiving to taylor and bill and all his management in the studio soul patrol to all that make us so thankful and bless to be on the journey with taylor soul patrol with a big smile. Thanks, TaysH! I see, he’s still wearing his Grease after show outfit – is this a lucky outfit & we just haven’t heard? LOL! At least, a few of these guys, besides Bill, look familiar & that’s going to make me crazy. 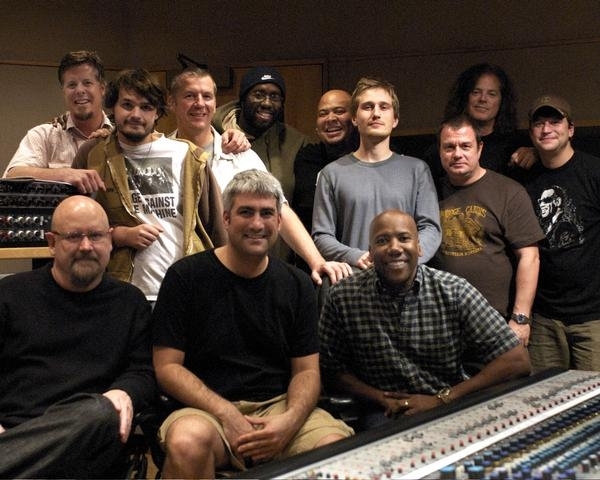 Credit to Cochem at Boogie for identifying Nathan East, on Taylor’s right(looking at the photo). I know him from the jazz group Fourplay – one of my all-time favorites. Serious question for Cochem — what was the name of the guy from Boston who said said he had been in the studio in Nashville working on music with Taylor? Wow, this couldn’t have come at a better time for me — this was a real spirit-lifter. What a delight to see Taylor look so happy, in the studio, surrounded by friends and musicians. Just by the looks of it, it seems as if the new album will be a fantastic group effort. I can’t wait! Thank you for this wonderful gift. I bow once again to your mad finding skillz. Happy Thanksgiving! Happy Thanksgiving…indeed!!!! Play that funky music boys!!!! My heart is about to explode with happiness and anticipation. Looks like Bill may be inheriting some of Taylor’s t-shirts…LOL And who’s the guy in the Rage Against the Machine shirt….this record will be VERY INTERESTING!!! Love the Summer barricade outfit….he’s too much!!!! Thanks so much for the beautiful picture of Taylor in the studio. I’m so happy to see him looking so happy! What a nice Thanksgiving present. Great picture. What a treat! A wonderful Thanksgiving present!!! Thank you Bloggerina and HAPPY THANKSGIVING to all the Soul Patrol! Nathan East??? Eric Clapton’s bass player Nathan East??? Something good’s coming. Something real good. Great, great shot, tays. You are a miracle-worker and we thank you. Now I just know there are among us people who can id Taylor’s gang members…. The man in the back beside Bill looks sooo familiar, it’s driving me nuts, somebody must recognize him?? Having dessert before my dinner!! Wow they all look happy, and like they’ve been creating some great music!! Happy Thankgiving to everyone and to Tays Harmonica for bringing us this shot. WOW! A great picture. I love the knee shot too. Taylor has a new blog at his MySpace. He is just to sweet. Thanks for the picture. Now to go study it some more. The guy beside BW looks like Kenny G, but I’m pretty sure it’s not. He looks so happy! What a great Turkey Day gift. Can’t wait for the new cd. Thanksgiving dinner with the family is over and I had no room for dessert…until now. A recent happy Taylor photo is a perfect way to end a day of feasting. Just one request, though. Can I have mine ala mode? I think the guy sitting to the left of taylor is carrie underwoods produer. Or at least he looks like him alot, because I have a DVD interveiw of Carrie talking about her CD (which the DVD came with) and her producer talks, too. Just had a chance to get on my computer and what a wonderful surprise. Taylor, indeed looks happy…oh happy day…this should be a great CD. How exciting to see this photo. Taylor looks so happy. He’s where he wants to be, making music in a studio with some of music’s best musicians and producers. You all are great, recognizing faces in this picture. Facinating bit of news. O.k. I don’t know much, but even I recognize the guy next to Bill. And by recognize I mean he looks familiar, very familiar. Dang, who is that guy? I wish I could place him, but I wouldn’t know where to start an investigation. Oh well, I know someone will know. Bless your heart, and bless Taylor’s, too. When you care so much for somebody as we do for TH, it’ll just make your day to see them so happy! I hope this album is the big breakout he wants and needs. In the TV guide article, Taylor mentions acting …hope he can make some connections in the film world while he’s on the west coast. Wouldn’t it be great to see him on the big screen?!?!? I just dropped in too not expecting so much here today! Thank you, thank you TsH. The studio shot is soooooo very nice. And Bill Will’s there, too!